MICHELLE: I thought it’d be an easy choice for The Tale of Genji, but now Maiden Railways is up in the mix, too. Guess I’ll just have to get both. Darn. ANNA: Why not both? It seems like a good decision to me! SEAN: There are many worthy choices, including the two titles mentioned above. That said, I have to go with Today’s Menu with the Emiya Family, the happy-ending-for-everyone series that every Fate fan wants deep down. KATE: I’m stoked for The Tale of Genji! Waki Yamato is a shojo pioneer who has a flair for melodrama. If Genji is a hit with American readers, I hope that we’ll also see an English-language edition of Haikara-san: Here Comes Miss Modern, the series that won her the Kodansha Manga Award back in 1977. Hey, a reader can dream, can’t she? ASH: The Tale of Genji has my official pick this week, too. Particularly impressive from me considering the fact that at the moment the series is only being released digitally. MELINDA: I think my pick is probably pretty obvious. 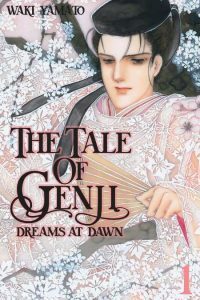 With my deep love for vintage shoujo manga, there’s no choice for me but The Tale of Genji. I am so excited to pick it up!